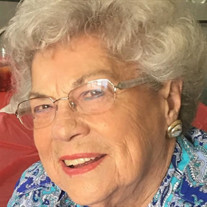 Emma Jo Buckner, 88 of Morristown, passed away Tuesday, January 22, 2019 at The Heritage Center. She was a loving and wonderful wife, mother and grandmother who enjoyed spending time with her family, playing Bridge with her close friends, and singing in the Choir at Centenary United Methodist Church where she had been a longtime faithful member. Jo was preceded in death by her husband: Arthur Phillip Buckner; sister and brother-in-law: Betty Buckner Rippetoe and Buster Rippetoe. Left to cherish her memory are her son and daughter-in-law: Michael Phillip (Pat) Buckner; their children: Lindsay B. (Ryan) Stewart, Casey B. (Mark) Carswell and Jenni B. (Grant) Fox. Daughter and son-in-law: Donna Buckner (David) Rowan; their children: John David (Sarah) Rowan and Phillip Minor (Mecha) Rowan and 9 great grandchildren. Sister: Bonnie Carver and several nieces and nephews. Visitation will be Friday, January 25, 2019 from 12 Noon until 2:00 PM at Centenary United Methodist Church. Funeral services will follow at 2:00 PM with Rev. Bryan Wyke officiating. Interment will follow in Hamblen Memory Gardens. Active pallbearers will be Ryan Stewart, Mark Carswell, Grant Fox, John and Phillip Rowan and Jeff Rippetoe. Honorary pallbearers are Connor David Rowan and Chandler Phillip Rowan. In lieu of flowers, donations in her honor are requested for Centenary United Methodist Church, 206 N Jackson St, Morristown, TN 37814.